Looking for a desert Adventure? Then check out the Private 4WD Jeep Safari & Hiking in Colored Canyon in Egypt. On this tour visitors will travel by 4WD across the desert to Abu Galum & enjoy colors reflecting from the oxidized surfaces at the Colored Canyon. Imagine racing through the desert sands of Egypt in a 4WD vehicle, watching camels and incredible scenery zoom by. The Private 4WD Jeep Safari & Hiking in Colored Canyon trip is the experience of a lifetime. Your tour will take you across the desert to Abu Galum where you will see the incredible phenomenon of the Colored Canyon. The jeep safari begins when you are picked up by your guide at your Sharm el Sheikh hotel. 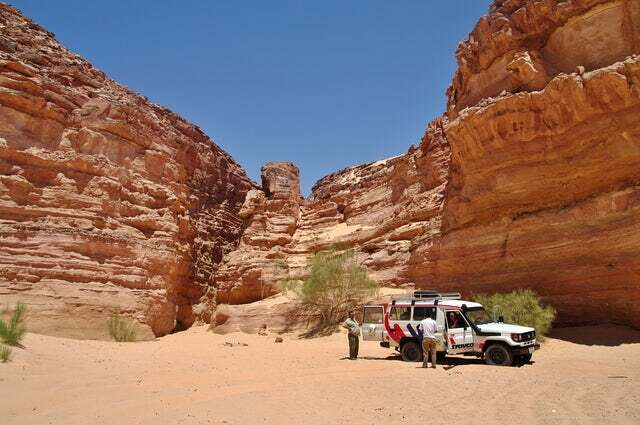 You will then begin the 240 kilometre journey toward the Colored Canyon with plenty of time for pictures along the way. When you arrive you will began an exhilarating hike through the different formations in the mountain as they reflect incredible colors in the sun. Watch out for the local wildlife, Nubian Ibex, Red Foxes and Striped Hyenas can all be seen in the area. On the way back home you will stop at a seaside restaurant for some lunch before finishing with some shopping in Dahab. The Private 4WD Jeep Safari & Hiking in Colored Canyon is a trip of a lifetime, call us today to book your trip.